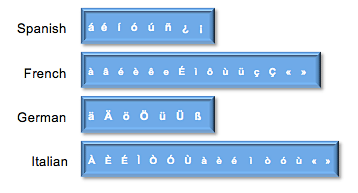 For the languages listed above, the test will include a character box where the appropriate symbols and accented letters are included and can be clicked. No additional action is required to setup a virtual keyboard for these languages. Test Takers may use a Romanized version (such as Pinyin or Romaji) of a character-based language. However, in doing so, the test taker will top-out at the novice-high level. In order to score at the intermediate level or higher, test takers must show ability to use characters.